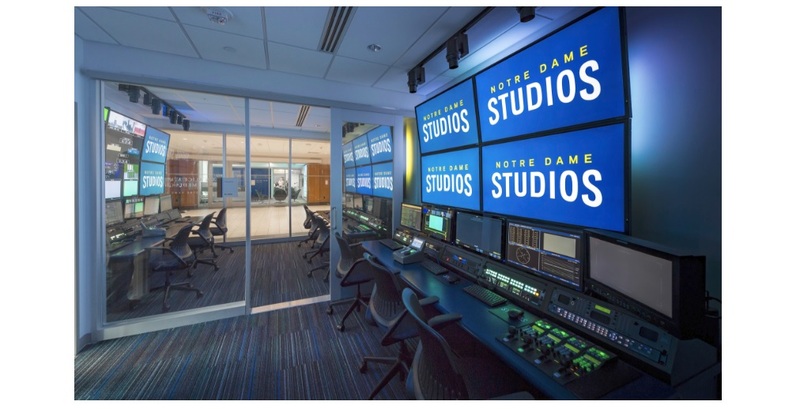 Notre Dame’s Martin Media Center sets a school’s course for the future, expanding AV content by exclusively using IP routing. All photos courtesy Notre Dame. Announcer desks ready to go. Broadcasts of lacrosse and other sports have their live feeds and their post-produced video done from theRex and Alice A. Martin Media Center. The ivy-covered walls of academia have been giving way in recent years to strands of a different sort. Cat-6 and fiber cables twist and turn under computer flooring, turning universities into media centers. It’s an evolution driven as much by broadcast sports and the allure of a media-content explosion typified by Netflix and Spotify as it is purely an educational proposition. The University of Notre Dame in South Bend, Ind., offers a near-perfect example, albeit one that did not come easily. The school routinely ranks in the top 25 in the U.S. News & World Report survey of America’s best colleges and in the Learfield Sports Directors’ Cup standings of the best overall athletics programs. Thus, it’s not surprising that the university’s new 18,000-square-foot Rex and Alice A. Martin Media Center is also at the top of the media game. Most notably, the facility is one of a handful of live-production media centers in the world to sport an exclusively IP routing infrastructure and the first at a major university. Scott Rinehart, Director of Broadcast Technology for Notre Dame Studios, was tapped to the lead the Martin Media Center project, which would also be at the center of UND’s Campus Crossroads long-range strategic initiative, intended to integrate 800,000 square feet of classroom, research, student life, media, performance, meeting, event, and hospitality space in three newly built buildings adjacent and attached to the west, east and south sides of Notre Dame Stadium. The Martin Media Center is one of a handful of live-production media centers in the world to have an all-IP routing infrastructure and the first at a major university to do so. 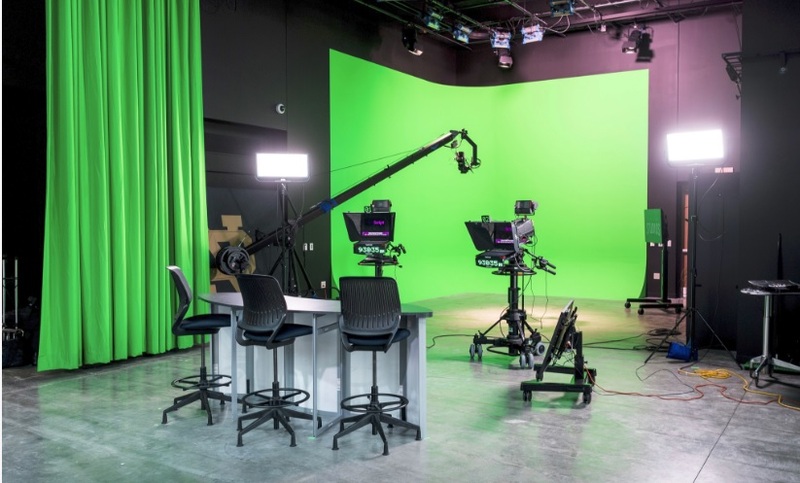 The new facility comprises one large production studio, a teaching studio, two nine-position production control rooms, two audio control rooms, a camera shading room, a slow-motion replay room, and eight fiber-connected editing suites. You’d think that such an ambitious undertaking might want to stick to well-trodden paths for its technology strategy, but Rinehart went the opposite way. He proposed, and the school agreed, to pursue IP-based connectivity throughout the new facility, and well beyond —1,400 single-mode fiber paths already connect everything from athletic venues to the performing arts center, plus an additional 1,700 strands currently in the planning stages. Rinehart says there was surprisingly little push back to this ambitious plan. Notre Dame Studios, the school’s equivalent of NFL Films, heads up the Martin Media Center project, which is also at the center of UND’s Campus Crossroads long-range strategic initiative, intended to integrate 800,000 square feet of classroom, research, student life, media, performance, meeting, event, and hospitality space in three newly built buildings adjacent to Notre Dame Stadium. Not that there weren’t plenty of the latter. Rinehart says when they began implementing the plan in earnest nearly three years ago, the array of IP-based broadcast and media products and IP routing systems was a fraction of what it is now. Brendan Cline, the Martin Media Center project engineer for Beck TV, the integration firm retained for the project, says what looked initially like one of the rare advantages of any major undertaking — getting brought on board as the integrator in the very earliest stages of planning — wasn’t necessarily as beneficial as it might have been. “Usually, coming to a project a year or more before it starts is good, because you get an opportunity to have some influence on it,” he says. 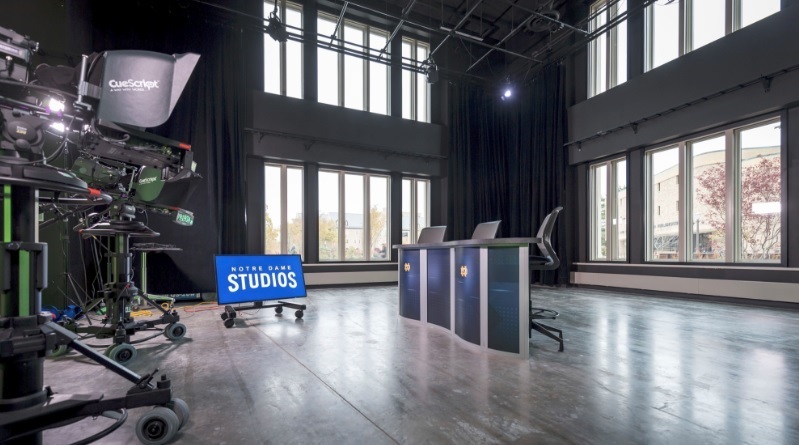 One of two nine-position production control rooms, two audio control rooms, a camera shading room, a slow-motion replay room, a large production studio, a teaching studio, and eight fiber-connected editing suites that comprise the facility. Cline says knowledge gaps about all IP routing systems often manifested themselves as the Martin Media Center project progressed. At the time the project commenced, the IP universe was still in flux. 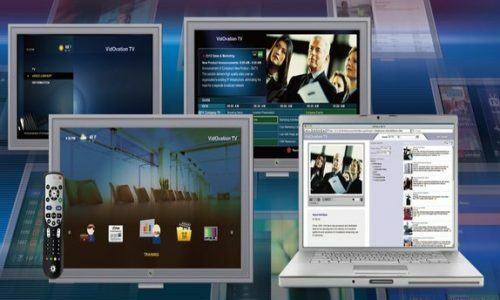 He notes that the SMPTE ST 2110 Professional Media Over Managed IP Networks set of standards, which beginning in 2017 established the standards suite that specifies the carriage, synchronization, and description of separate elementary essence streams over IP for real-time production, play out, and other professional media applications, formally replacing SDI, was still over the horizon (although, he adds, the ASPEN — Adaptive Sample Picture Encapsulation — format developed by Evertz and based on MPEG-2 Systems transport over IP, acted as “a good stepping stone towards how 2110 was expected to work”). That meant that much of the planning and programming was done as the technicians were themselves learning the ropes of IP. They were moving from a base band world where routers had a few hundred hard-patched end points to one where thousands of signals could go anywhere at any time, using products that Cline says in some cases were literally stamped as serial No. 1. This was particularly palpable working with one of the first installations in a sports-production environment of Evertz Microsystem’s EXE IP router, which was a core element in the new media hub, as well as with other relatively new IP routing systems and peripherals, such as new ASE67 cards and panels for Riedel’s Artist intercom system frames,and the Axia Fusion IP audio console from Telos Alliance. Both of those platforms benefited from the recent introduction of the AES67 audio-over-IP standard, which had been first published three years earlier. All of these technology platforms are state of the art, but each had the sort of issues that come with the initial versions of leading-edge IP routing systems, as well as the sometimes-bumpy interface of peripherals that were also in their own early stages. “The challenge was the integration of the EXE with the peripheral pieces, many of which were Evertz products,” he explains. Audio systems at the Martin Media Center benefited from the introduction of the AES67 audio-over-IP standard, which enabled fully networked audio at the facility. “For example, the new MSC5700 master clock was a first-run product, IP direct connections to the Dreamcatcher replay system were first run, and the IP audio de-embedding EMR-AG-HUB was also a first run.” All of these dynamics created a difficult learning curve under fire. However, going the IP route is what enabled that much complexity to be adequately managed. “The IP infrastructure over fiber and the AoIP solutions have expanded our capabilities,” Rinehart explains. Everything did ultimately come together. The Evertz router is at the system core and now connects spaces in the Martin Media Center to three additional control rooms and one studio located at the campus’ Joyce Center, allowing the university to use any one of five control rooms as a remote production room for any venue on campus equipped with fiber connectivity. Axia Fusion mixers are deployed in the audio control rooms for sharing of audio between the router, intercom and mixer. The Fusion consoles, installed in two control rooms in the Martin Media Center as well as in the two original control rooms, manage nearly 450 AES67 streams from the Evertz router via a single Cat-6 Ethernet cable(with a redundant Cat-6 line as back-up), allowing the sharing of local audio devices and their associated GPIO control across multiple studios to maximize efficiency and reduce cost. The Bolero intercoms connect every location seamlessly. The Martin Media Center was a pioneer in moving from a base band world where routers had a few hundred hard-patched end points to one where thousands of signals could go anywhere at any time. The new Martin Media Center was put quickly to work on practical applications. 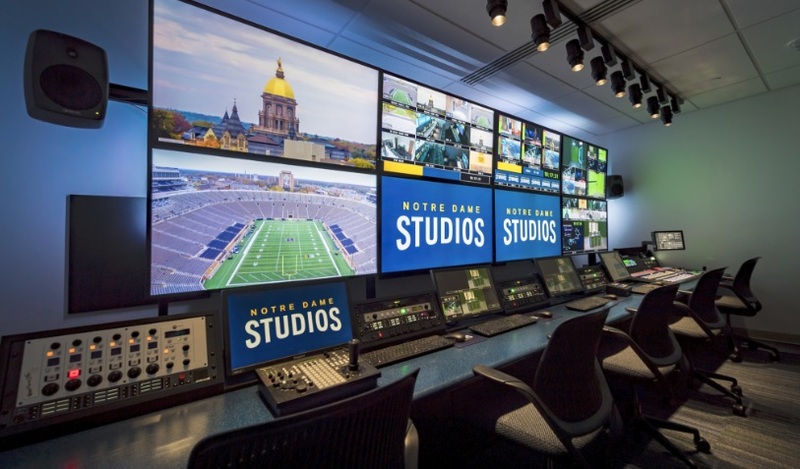 For instance, the nearly 90-year-old Notre Dame Stadium got its first video scoreboard last year, and the media center created its first onscreen productions. Broadcasts of lacrosse and other sports have their live feeds and their post-produced video done from there. The immediate future holds what will be the first music concert ever performed at ND Stadium (Garth Brooks) and the NHL’s mid-season Winter Classic match, traditionally played on New Year’s Day in an outdoor stadium, will take place there Jan. 1. All will involve the media center’s capabilities to some extent. Looking back, Cline says the outcomes were highly desirable. “For instance, the router is capable of so much I/O [inputs/outputs] that you can scale to any level for 4K and beyond, which makes you ready for the future and is so far beyond where base band could take you,” he says. 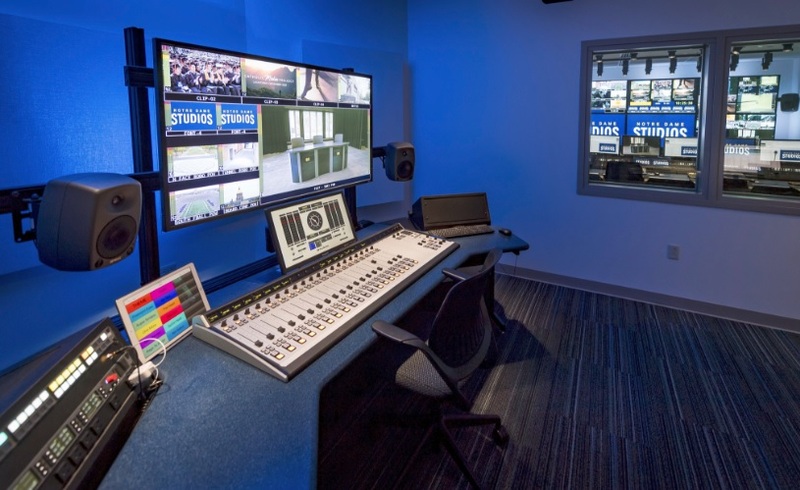 The outcome of the Martin Media Center project was both a state-of-the-art media facility that both supports the school’s own productions for sports and academia, but also acts as a beacon for technology-inclined high school seniors who might have otherwise been looking at M.I.T. or Stanford, perhaps, for a technology-heavy environment. Rinehart says part of the reward for taking the chance to be early in the IP domain is that much of its technology is getting a jump on the advantages that come with a fully networked AV environment. He points to the Telos Alliance node media interfaces on the consoles, which are largely self-configuring. It will also benefit from IP-based equipment’s ability to be thoroughly upgraded via firmware updates. “You just change out the firmware on either end of the fiber and it’s like having an entirely new box,” Rinehart says, noting how just such an update to the Riedel intercom system added six new operating features. As result of that paradigm, though, the Martin Media Center may never be actually “finished,” Rinehart acknowledges.